Photos and video courtesy of Taco Bell. After saving the Southern Pacific Railroad Depot at the start of this year, the Long Beach-based non-profit We Are The Next (Next) is adding the very first Taco Bell to its list of historic buildings it has saved from the wrecking ball. Affectionately known as “Numero Uno”, the 1960s-era eatery will take a journey similar to that of the depot, taking a ride on a flatbed truck under the cover of night to its temporary home in Irvine, where it will be housed while restoration efforts are finalized. The original building served as a Taco Bell until 1986, when it was vacated by company because the addition of a drive-thru—something that had become one of the company’s new standards—was deemed not possible. The location continued to serve up tacos through December 2014, though not of the Taco Bell variety. When it was closed and marked for demolition, the company was referred to Next to discuss the possibility of saving the structure and possibly relocating it. Next was hired by Taco Bell in March to oversee the relocation of its first storefront to its Irvine headquarters, where it will be housed in storage until plans for restoration and reuse are finalized. The deal was finalized after the taco giant launched a social media outreach campaign calling to #SaveTacoBell, after learning of the building’s fate from the Downey Conservancy. Katie Rispoli, executive director of Next, has an affinity for old structures and finding ways to adaptively reuse them in lieu of demolition. She says that changing the way people—especially young people—think about buildings, and helping them recognize the value of the architecture will change conservation conversations in the future. That’s a big reason why she started the nonprofit Next. Unlike the Long Beach Civic Center, built by one of her architectural heroes, Edward Killingsworth, the eatery was not designed by a famed architect nor is it considered objectively artistic in its composition—but it is historic. It also stands as a symbol of a man, Bell, who built the taco dynasty from humble beginnings. 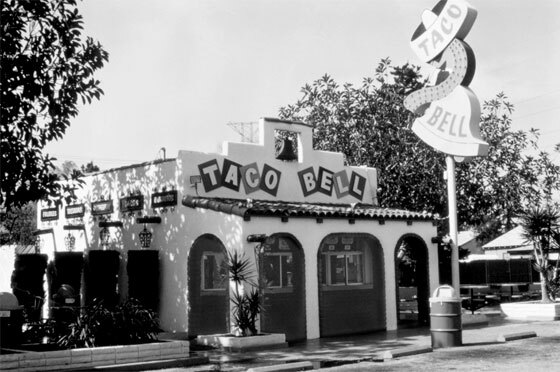 In 1978, 16 years after opening the Downey location, Bell sold 868 Taco Bell restaurants to PepsiCo, Inc for $125 million in stock. 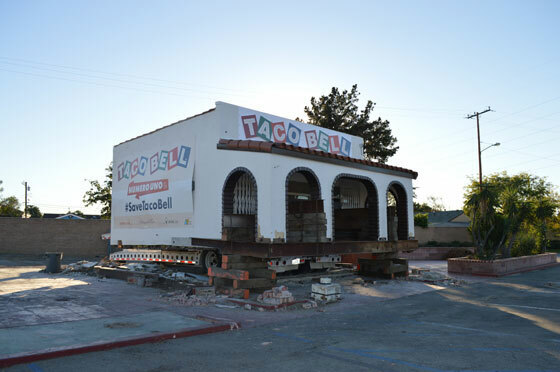 The move will begin at 10:30PM Thursday night when the roughly 400 square foot structure will be transported about 45 miles from its home in Downey through Norwalk, Cerritos, La Palma, Buena Park, Anaheim, Tustin and Orange before finally arriving at the Taco Bell headquarters in Irvine Friday morning. The company is encouraging people to congregate at restaurants in Downey, Anaheim, Orange and Irvine along the route to use them as watch points.